Maurice Pinay: Vatican II Kabbalist Sage, Rabbi Abraham Heschel: "I Want to Attack Their Souls"
Returning to the biography of the Hasidic change agent, Rabbi Abraham Heschel (Spiritual Radical, by Edward K. Kaplan, Yale University Press). In this book is an account of an interview Rabbi Heschel gave during the time the Vatican II document Nostra Aetate, which Heschel collaborated on, was being deliberated. The interview reveals an attitude of remarkable hostility to Christians, which should come as no surprise to those knowledgeable of the rabbinic tradition. What may surprise some (but shouldn't at this point) is that such a hostile character would be invited by Vatican officials to participate in the writing of a Church council document. 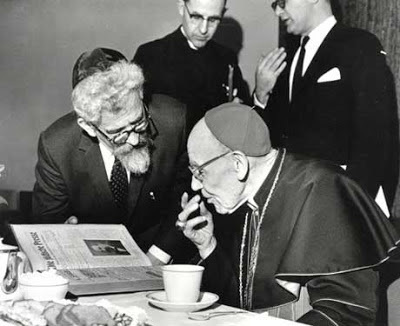 First some background: In Heschel's many meetings with Vatican officials (as an agent of the American Jewish Comittee) regarding Nostra Aetate, mostly with Augustin Bea, but including a secretive meeting with Paul VI, Heschel was most adamant that the document should clearly proclaim his belief that it is unacceptable for Christians to seek the conversion of "Jews." Heschel's chutzpah in peddling this absurd idea (which consequently would undercut Christ's incarnation, evangelical mission and sacrifice) went to the extreme of appealing to the non-Biblical, relativistic, Talmudic anti-principle mipnei darchai shalom during his meeting with Paul VI. During the deliberations, a draft of the Nostra Aetate document was leaked to the press which did not include the prohibition against converting "Jews" which Heschel desired. This infuriated Heschel, and in response he wrote an editorial published by the New York Times and Time magazine in which he proclaimed, "As I have repeatedly stated to leading personalities of the Vatican, I am ready to go to Auschwitz any time, if faced with the alternative of conversion or death." Edward Kaplan (citing Schuster's notes on record at AJC/Paris) writes that AJC European director, Zachariah Schuster warned Heschel that this outburst had been embarrassing to their Vatican collaborators but that Heschel replied undauntedly, "I had my own private reasons for making this remark." Heschel later revealed what those private reasons were to Stern Gang terrorist, Geula Cohen in an interview which she conducted for the Israeli newspaper, Ma'ariv. "This statement of yours made me proud. Yet, I would have written it differently, saying: 'if this were the only way in which I would be permitted to live, I would have endeavored to send them [Christians] to Auschwitz.'" "Frankly, I assert that the statement on Auschwitz, of which you are proud, is the strongest statement possible, and it has shaken many people throughout the world." And there you have the motivation behind "dialogue" with "elder brothers" so succinctly summed up by one of the greatest pioneers of interfaith "dialogue" who participated in the writing of a Church council document, Nostra Aetate. Rabbinic warfare against Christian souls is not fought with guns and bombs, but with "conversation" and "discussion." Here we see the subtlety of rabbinic warfare--utterly undefended against--even as the rabbis conscribe their spiritually conquered prisoners and their resources to fight their war against the specter of "Islamofascist" "Amalek." He's not attacking anyones soul with that stupid comment ...and his equally stupid explanation -people are free to either accept or reject the Christian message and he knows it. represents as satanic as the good Talmudist Herschel makes it sound? Anónimo: Sr Rabino, soy cristiano y me dirijo a Ud.con el mayor de los respetos,porque Nuestro Señor Jesucristo al cual uds.blasfemaron y crucificaron, tambien fué Rabino Maestro de la Ley.Sepa pues ciertísimamente oh Casa de Israel que a éste Jesus a quien Uds. crucificaron Dios le ha hecho Señor y Cristo,habiéndole resucitado de entre los muertos,y le dió un Nombre que es sobre todo Nombre,para que en el Nombre de Jesús se doble toda rodilla de los que están en los cielos como en la tierra y debajo de la tierra y toda lengua confiese que JESUCRISTO ES EL SEÑOR,para Gloria de DIOS PADRE. le bendiga y le conceda la Paz!. Paz sea sobre Israel!. "I never want to see another Jew or a Tattoo again." "The voice of Jacob': this is the cry caused by the (Roman) Emperor Hadrian who killed in the city of Bethar four hundred thousand myriads"
Jews always had a problem with numbers! Was it 6 Million or 4 Billion? What's a few 000000 between claims?